Chadwick Boseman is baseball great Jackie Robinson in 42. The biographical sports drama 42 follows the great baseball player Jackie Robinson and legendary Brooklyn Dodgers General Manager Branch Rickey as they take a stand against racism and break through baseball’s infamous color line. 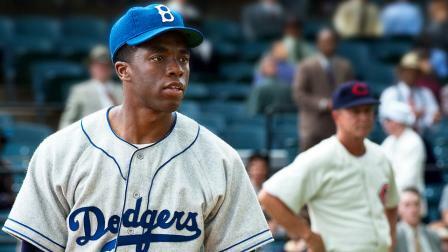 In 1946, Branch Rickey (Harrison Ford, Cowboys & Aliens) put himself at the forefront of history when he signed Jackie Robinson (Chadwick Boseman, TV’s Persons Unknown) to the Brooklyn Dodgers, breaking Major League Baseball’s infamous color line. But the deal also put both Robinson and Rickey in the firing line of the public, the press and even other players. Facing unabashed racism from every side, Robinson was forced to demonstrate tremendous courage and restraint by not reacting in kind, knowing that any incident could destroy his and Rickey’s hopes. Instead, Number 42 let his talent on the field do the talking – ultimately winning over fans and his teammates, silencing his critics, and paving the way for others to follow. Directed by Brian Helgeland, 42 co-stars Nicole Beharie (Shame) as Jackie’s wife Rachel Robinson, Christopher Meloni (TV’s Law & Order, SVU) as Dodgers manager Leo Durocher, and Lucas Black (Promised Land) and Hamish Linklater (The Future) as ballplayers Pee Wee Reese and Ralph Branca. The PG-13-rated film opened wide in U.S. theaters to critical acclaim in April, 2013, ringing up a handsome $95 million at the domestic box office as of this week.